In the sixth century B.C., the "reformer" Siddhartha Gautama (Buddha) rejected the caste system associated with Hinduism and propagated universal compassion and nonviolence toward all living things. He did not see himself as the founder of a religion but rather as an advocate of a self-redeeming doctrine that had strong ethical traits. The underlying belief of Buddha's philosophy was that human existence, fundamentally, meant suffering. His goal was to overcome suffering, which he believed was caused by worldly desires and passions. This goal could be achieved, he believed, by immersion in the true nature of things and the rejection of self and would culminate in nirvana. Nirvana, directly translated as "nothing," is the cessation of the reincarnation cycle and the liberation from suffering as a result of this release from existence on Earth. As Buddhism spread through Asia, and the monks and laity built their own organizational structures, it absorbed elements of folk religions. The development of the compassionate redemption figure (bodhisattva) was one result. Graduallv Buddhism evolved into a religion with its own temples and cults. The early rulers of India, from the sixth century B.C. on, installed Buddhism as a form of state religion, so that Hinduism was, at times, completely suppressed on the subcontinent. Buddhism split into several differing schools: Hinayana ("lesser vehicle") Buddhism, with its 5 austere monks, and the more diverse and liberal Mahayana ("greater vehicle") Buddhism are two of the most significant schools. Contemporary 2 Tibetan Buddhism headed by the Dalai Lama represents a form of Vajrayana Buddhism. 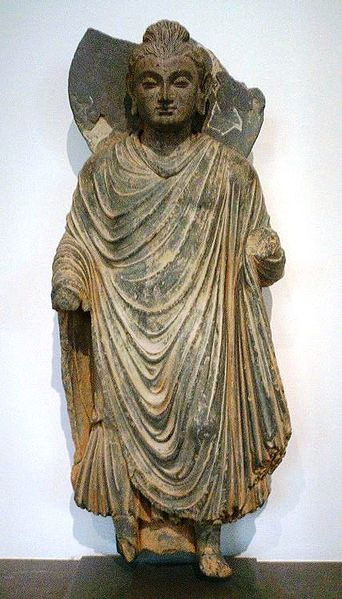 Seated Buddha, Gandhara, 2nd century CE. with popular schools today being Pure Land and Zen. Ancient Buddhist scripture and doctrine developed in several closely related literary languages of ancient India, especially in Pali and Sanskrit. In this article Pali and Sanskrit words that have gained currency in English are treated as English words and are rendered in the form in which they appear in English-language dictionaries. Exceptions occur in special circumstances�as, for example, in the case of the Sanskrit term dharma (Pali: dhamma), which has meanings that are not usually associated with the English �dharma.� Pali forms are given in the sections on the core teachings of early Buddhism that are reconstructed primarily from Pali texts and in sections that deal with Buddhist traditions in which the primary sacred language is Pali. Sanskrit forms are given in the sections that deal with Buddhist traditions whose primary sacred language is Sanskrit and in other sections that deal with traditions whose primary sacred texts were translated from Sanskrit into a Central or East Asian language such as Tibetan or Chinese. Buddhism arose in northeastern India sometime between the late 6th century and the early 4th century bce, a period of great social change and intense religious activity. 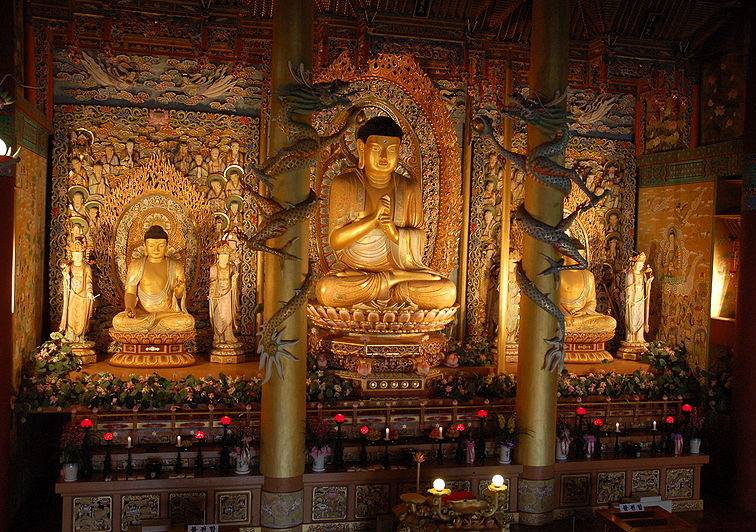 There is disagreement among scholars about the dates of the Buddha�s birth and death. Many modern scholars believe that the historical Buddha lived from about 563 to about 483 bce. Many others believe that he lived about 100 years later (from about 448 to 368 bce). At this time in India, there was much discontent with Brahmanic (Hindu high-caste) sacrifice and ritual. In northwestern India there were ascetics who tried to create a more personal and spiritual religious experience than that found in the Vedas (Hindu sacred scriptures). In the literature that grew out of this movement, the Upanishads, a new emphasis on renunciation and transcendental knowledge can be found. Northeastern India, which was less influenced by the Aryans who had developed the main tenets and practices of the Vedic Hindu faith, became the breeding ground of many new sects. Society in this area was troubled by the breakdown of tribal unity and the expansion of several petty kingdoms. Religiously, this was a time of doubt, turmoil, and experimentation. A proto-Samkhya group (i.e., one based on the Samkhya school of Hinduism founded by Kapila) was already well established in the area. New sects abounded, including various skeptics (e.g., Sanjaya Belatthiputta), atomists (e.g., Pakudha Kaccayana), materialists (e.g., Ajita Kesakambali), and antinomians (i.e., those against rules or laws�e.g., Purana Kassapa). The most important sects to arise at the time of the Buddha, however, were the Ajivikas (Ajivakas), who emphasized the rule of fate (niyati), and the Jains, who stressed the need to free the soul from matter. Although the Jains, like the Buddhists, have often been regarded as atheists, their beliefs are actually more complicated. Unlike early Buddhists, both the Ajivikas and the Jains believed in the permanence of the elements that constitute the universe, as well as in the existence of the soul. Despite the bewildering variety of religious communities, many shared the same vocabulary�nirvana (transcendent freedom), atman (�self� or �soul�), yoga (�union�), karma (�causality�), Tathagata (�one who has come� or �one who has thus gone�), buddha (�enlightened one�), samsara (�eternal recurrence� or �becoming�), and dhamma (�rule� or �law�)�and most involved the practice of yoga. According to tradition, the Buddha himself was a yogi�that is, a miracle-working ascetic. Buddhism, like many of the sects that developed in northeastern India at the time, was constituted by the presence of a charismatic teacher, by the teachings this leader promulgated, and by a community of adherents that was often made up of renunciant members and lay supporters. In the case of Buddhism, this pattern is reflected in the Triratna�i.e., the �Three Jewels� of Buddha (the teacher), dharma (the teaching), and sangha (the community). In the centuries following the founder�s death, Buddhism developed in two directions represented by two different groups. One was called the Hinayana (Sanskrit: �Lesser Vehicle�), a term given to it by its Buddhist opponents. This more conservative group, which included what is now called the Theravada (Pali: �Way of the Elders�) community, compiled versions of the Buddha�s teachings that had been preserved in collections called the Sutta Pitaka and the Vinaya Pitaka and retained them as normative. The other major group, which calls itself the Mahayana (Sanskrit: �Greater Vehicle�), recognized the authority of other teachings that, from the group�s point of view, made salvation available to a greater number of people. These supposedly more advanced teachings were expressed in sutras that the Buddha purportedly made available only to his more advanced disciples. 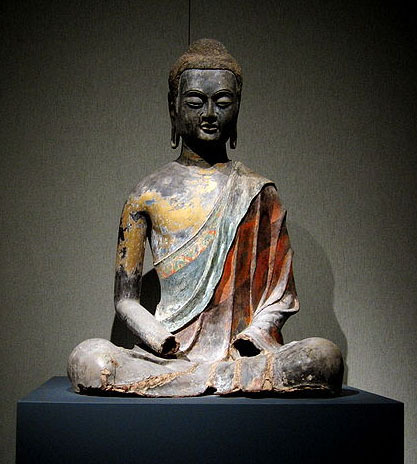 As Buddhism spread, it encountered new currents of thought and religion. In some Mahayana communities, for example, the strict law of karma (the belief that virtuous actions create pleasure in the future and nonvirtuous actions create pain) was modified to accommodate new emphases on the efficacy of ritual actions and devotional practices. During the second half of the 1st millennium ce, a third major Buddhist movement, Vajrayana (Sanskrit: �Diamond Vehicle�), or Esoteric Buddhism, developed in India. This movement was influenced by gnostic and magical currents pervasive at that time, and its aim was to obtain spiritual liberation and purity more speedily. Despite these vicissitudes, Buddhism did not abandon its basic principles. Instead, they were reinterpreted, rethought, and reformulated in a process that led to the creation of a great body of literature. This literature includes the Pali Tipitaka (�Three Baskets�)�the Sutta Pitaka (�Basket of Discourse�), which contains the Buddha�s sermons; the Vinaya Pitaka (�Basket of Discipline�), which contains the rule governing the monastic order; and the Abhidhamma Pitaka (�Basket of Special [Further] Doctrine�), which contains doctrinal systematizations and summaries. These Pali texts have served as the basis for a long and very rich tradition of commentaries that were written and preserved by adherents of the Theravada community. The Mahayana and Vajrayana/Esoteric traditions have accepted as Buddhavacana (�the word of the Buddha�) many other sutras and tantras, along with extensive treatises and commentaries based on these texts. Consequently, from the first sermon of the Buddha at Sarnath to the most recent derivations, there is an indisputable continuity�a development or metamorphosis around a central nucleus�by virtue of which Buddhism is differentiated from other religions. The historical figure referred to as the Buddha (whose life is known largely through legend) was born on the northern edge of the Ganges River basin, an area on the periphery of the ancient civilization of North India, in what is today southern Nepal. He is said to have lived for 80 years. His family name was Gautama (in Sanskrit) or Gotama (in Pali), and his given name was Siddhartha (Sanskrit: �he who achieves his aim�) or Siddhatta (in Pali). He is frequently called Shakyamuni, �the sage of the Shakya clan.� In Buddhist texts he is most commonly addressed as Bhagavat (often translated as �Lord�), and he refers to himself as the Tathagata, which can mean both �one who has thus come� and �one who has thus gone.� Traditional sources on the date of his death�or, in the language of the tradition, his �passage into nirvana��range from 2420 to 290 bce. Scholarship in the 20th century limited this range considerably, with opinion generally divided between those who believed he lived from about 563 to 483 bce and those who believed he lived about a century later. The Buddha�s place within the tradition, however, cannot be understood by focusing exclusively on the events of his life and time (even to the extent that they are known). Instead, he must be viewed within the context of Buddhist theories of time and history. Among these theories is the belief that the universe is the product of karma, the law of the cause and effect of actions. The beings of the universe are reborn without beginning in six realms as gods, demigods, humans, animals, ghosts, and hell beings. The cycle of rebirth, called samsara (literally �wandering�), is regarded as a domain of suffering, and the Buddhist�s ultimate goal is to escape from that suffering. The means of escape remains unknown until, over the course of millions of lifetimes, a person perfects himself, ultimately gaining the power to discover the path out of samsara and then revealing that path to the world. A person who has set out to discover the path to freedom from suffering and then to teach it to others is called a bodhisattva. A person who has discovered that path, followed it to its end, and taught it to the world is called a buddha. Buddhas are not reborn after they die but enter a state beyond suffering called nirvana (literally �passing away�). Because buddhas appear so rarely over the course of time and because only they reveal the path to liberation from suffering, the appearance of a buddha in the world is considered a momentous event. The story of a particular buddha begins before his birth and extends beyond his death. It encompasses the millions of lives spent on the path toward enlightenment and Buddhahood and the persistence of the buddha through his teachings and his relics after he has passed into nirvana. 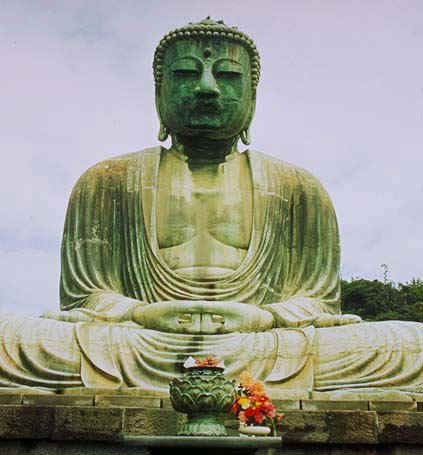 The historical Buddha is regarded as neither the first nor the last buddha to appear in the world. According to some traditions he is the 7th buddha, according to another he is the 25th, and according to yet another he is the 4th. The next buddha, Maitreya, will appear after Shakyamuni�s teachings and relics have disappeared from the world. Sites associated with the Buddha�s life became important pilgrimage places, and regions that Buddhism entered long after his death�such as Sri Lanka, Kashmir, and Burma (now Myanmar)�added narratives of his magical visitations to accounts of his life. Although the Buddha did not leave any written works, various versions of his teachings were preserved orally by his disciples. In the centuries following his death, hundreds of texts (called sutras) were attributed to him and would subsequently be translated into the languages of Asia. The teaching attributed to the Buddha was transmitted orally by his disciples, prefaced by the phrase �evam me sutam� (�thus have I heard�); therefore, it is difficult to say whether or to what extent his discourses have been preserved as they were spoken. They usually allude to the place and time they were preached and to the audience to which they were addressed. Buddhist councils in the first centuries after the Buddha�s death attempted to specify which teachings attributed to the Buddha could be considered authentic. Living amid the impermanence of everything and being themselves impermanent, human beings search for the way of deliverance, for that which shines beyond the transitoriness of human existence�in short, for enlightenment. 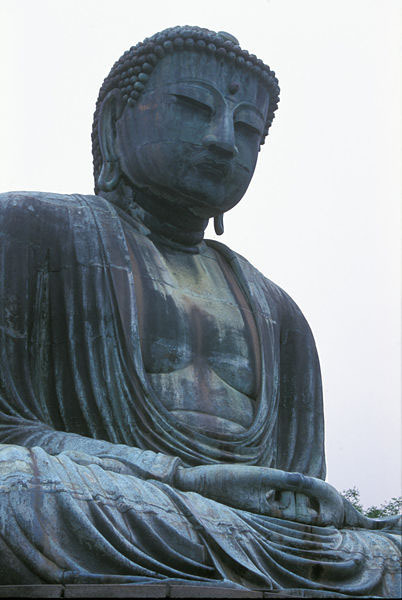 The Buddha�s doctrine offered a way to avoid despair. By following the �path� taught by the Buddha, the individual can dispel the �ignorance� that perpetuates this suffering. According to the Buddha of the early texts, reality, whether of external things or the psychophysical totality of human individuals, consists of a succession and concatenation of microelements called dhammas (these �components� of reality are not to be confused with dhamma meaning �law� or �teaching�). The Buddha departed from traditional Indian thought in not asserting an essential or ultimate reality in things. Moreover, he rejected the existence of the soul as a metaphysical substance, though he recognized the existence of the self as the subject of action in a practical and moral sense. Life is a stream of becoming, a series of manifestations and extinctions. The concept of the individual ego is a popular delusion; the objects with which people identify themselves�fortune, social position, family, body, and even mind�are not their true selves. There is nothing permanent, and, if only the permanent deserved to be called the self, or atman, then nothing is self. The belief in rebirth, or samsara, as a potentially endless series of worldly existences in which every being is caught up was already associated with the doctrine of karma (Sanskrit: karman; literally �act� or �deed�) in pre-Buddhist India, and it was accepted by virtually all Buddhist traditions. According to the doctrine, good conduct brings a pleasant and happy result and creates a tendency toward similar good acts, while bad conduct brings an evil result and creates a tendency toward similar evil acts. Some karmic acts bear fruit in the same life in which they are committed, others in the immediately succeeding one, and others in future lives that are more remote. This furnishes the basic context for the moral life. The acceptance by Buddhists of the teachings of karma and rebirth and the concept of the no-self gives rise to a difficult problem: how can rebirth take place without a permanent subject to be reborn? Indian non-Buddhist philosophers attacked this point in Buddhist thought, and many modern scholars have also considered it to be an insoluble problem. The relation between existences in rebirth has been explained by the analogy of fire, which maintains itself unchanged in appearance and yet is different in every moment�what may be called the continuity of an ever-changing identity. Awareness of these fundamental realities led the Buddha to formulate the Four Noble Truths: the truth of misery (dukkha), the truth that misery originates within us from the craving for pleasure and for being or nonbeing (samudaya), the truth that this craving can be eliminated (nirodhu), and the truth that this elimination is the result of following a methodical way or path (magga). The living process is again likened to a fire. Its remedy is the extinction of the fire of illusion, passions, and cravings. The Buddha, the Enlightened One, is one who is no longer kindled or inflamed. Many poetic terms are used to describe the state of the enlightened human being�the harbour of refuge, the cool cave, the place of bliss, the farther shore. The term that has become famous in the West is nirvana, translated as passing away or dying out�that is, the dying out in the heart of the fierce fires of lust, anger, and delusion. But nirvana is not extinction, and indeed the craving for annihilation or nonexistence was expressly repudiated by the Buddha. Buddhists search for salvation, not just nonbeing. Although nirvana is often presented negatively as �release from suffering,� it is more accurate to describe it in a more positive fashion: as an ultimate goal to be sought and cherished. In some early texts the Buddha left unanswered certain questions regarding the destiny of persons who have reached this ultimate goal. He even refused to speculate as to whether fully purified saints, after death, continued to exist or ceased to exist. Such questions, he maintained, were not relevant to the practice of the path and could not in any event be answered from within the confines of ordinary human existence. Indeed, he asserted that any discussion of the nature of nirvana would only distort or misrepresent it. But he also asserted with even more insistence that nirvana can be experienced�and experienced in the present existence�by those who, knowing the Buddhist truth, practice the Buddhist path. In the centuries following the Buddha�s death, the story of his life was remembered and embellished, his teachings were preserved and developed, and the community that he had established became a significant religious force. Many of the wandering ascetics who followed the Buddha settled in permanent monastic establishments and developed monastic rules. At the same time, the Buddhist laity came to include important members of the economic and political elite. During its first century of existence, Buddhism spread from its place of origin in Magadha and Kosala throughout much of northern India, including the areas of Mathura and Ujjayani in the west. According to Buddhist tradition, invitations to the Council of Vesali (Sanskrit: Vaishali), held just over a century after the Buddha�s death, were sent to monks living throughout northern and central India. By the middle of the 3rd century bce, Buddhism had gained the favour of a Mauryan king, Asoka, who had established an empire that extended from the Himalayas in the north to almost as far as Sri Lanka in the south. To the rulers of the republics and kingdoms arising in northeastern India, the patronage of newly emerging sects such as Buddhism was one way of counterbalancing the political power exercised by Brahmans (high-caste Hindus). The first Mauryan emperor, Candra Gupta (c. 321�c. 297 bce), patronized Jainism and, according to some traditions, finally became a Jain monk. His grandson, Asoka, who ruled over the greater part of the subcontinent from about 268 to 232 bce, traditionally played an important role in Buddhist history because of his support of Buddhism during his lifetime. He exerted even more influence posthumously, through stories that depicted him as a chakravartin (�a great wheel-rolling monarch�). He is portrayed as a paragon of Buddhist kingship who accomplished many fabulous feats of piety and devotion. It is therefore very difficult to distinguish the Asoka of history from the Asoka of Buddhist legend and myth. The first actual Buddhist �texts� that are still extant are inscriptions (including a number of well-known Asokan pillars) that Asoka had written and displayed in various places throughout his vast kingdom. According to these inscriptions, Asoka attempted to establish in his realm a �true dhamma� based on the virtues of self-control, impartiality, cheerfulness, truthfulness, and goodness. Although he promoted Buddhism, he did not found a state church, and he was known for his respect for other religious traditions. He sought to maintain unity in the Buddhist monastic community, however, and he promoted an ethic that focused on the layman�s obligations in this world. His aim, as articulated in his edicts, was to create a religious and social milieu that would enable all �children of the king� to live happily in this life and to attain heaven in the next. Thus, he set up medical assistance for human beings and beasts, maintained reservoirs and canals, and promoted trade. He established a system of dhamma officers (dhamma-mahamattas) in order to help govern the empire. And he sent diplomatic emissaries to areas beyond his direct political control. Asoka�s empire began to crumble soon after his death, and the Mauryan dynasty was finally overthrown in the early decades of the 2nd century bce. There is some evidence to suggest that Buddhism in India suffered persecution during the Shunga-Kanva period (185�28 bce). 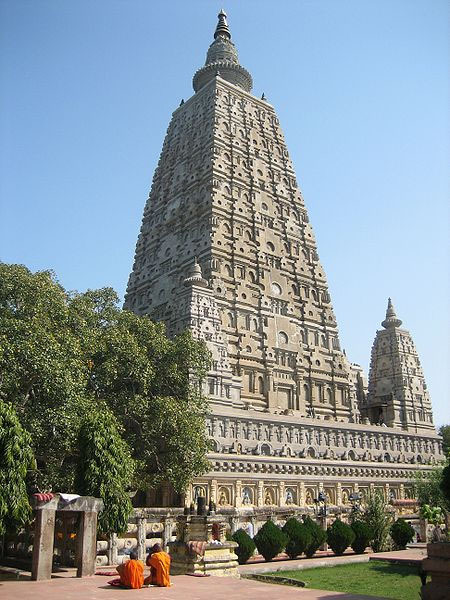 Despite occasional setbacks, however, Buddhists persevered; and before the emergence of the Gupta dynasty, which created the next great pan-Indian empire in the 4th century ce, Buddhism had become a leading if not dominant religious tradition in India. 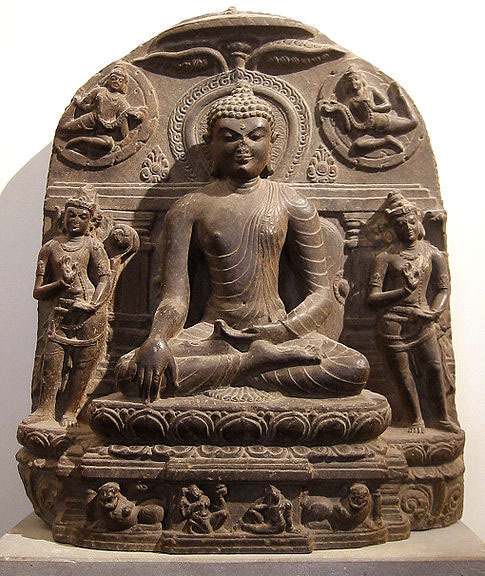 During the approximately five centuries between the fall of the Mauryan dynasty and the rise of the Gupta dynasty, major developments occurred in all aspects of Buddhist belief and practice. Well before the beginning of the Common Era, stories about the Buddha�s many previous lives, accounts of important events in his life as Gautama, stories of his �extended life� in his relics, and other aspects of his sacred biography were elaborated on. In the centuries that followed, groups of these stories were collected and compiled in various styles and combinations. Beginning in the 3rd century bce, and possibly earlier, magnificent Buddhist monuments such as the great stupas at Bharhut and Sanchi were built. During the early centuries of the 1st millennium ce, similar monuments were established virtually throughout the subcontinent. Numerous monasteries emerged too, some in close association with the great monuments and pilgrimage sites. Considerable evidence, including inscriptional evidence, points to extensive support from local rulers, including the women of the various royal courts. About the beginning of the Common Era, distinctively Mahayana tendencies began to take shape. It should be emphasized, however, that many Hinayana and Mahayana adherents continued to live together in the same monastic institutions. In the 2nd or 3rd century, the Madhyamika school, which has remained one of the major schools of Mahayana philosophy, was established, and many other expressions of Mahayana belief, practice, and communal life appeared. 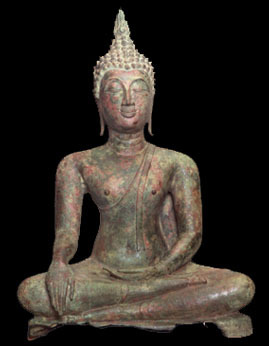 By the beginning of the Gupta era, the Mahayana had become the most dynamic and creative Buddhist tradition in India. 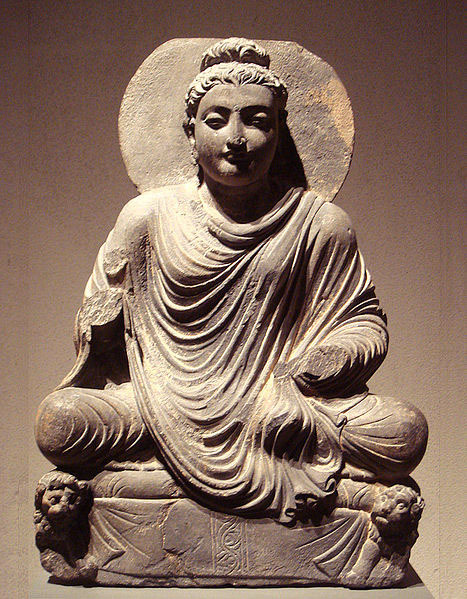 At this time Buddhism also expanded beyond the Indian subcontinent. It is most likely that Asoka sent a diplomatic mission to Sri Lanka and that Buddhism was established there during his reign. By the beginning of the Common Era, Buddhism, which had become very strong in northwestern India, had followed the great trade routes into Central Asia and China. 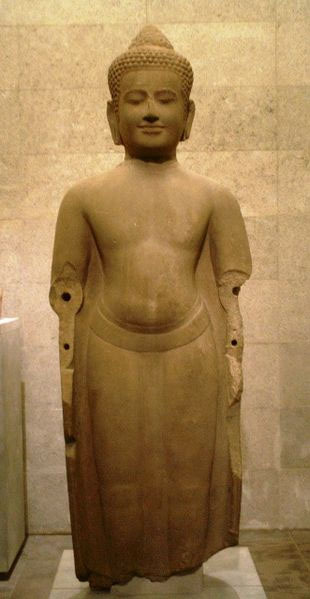 According to later tradition, this expansion was greatly facilitated by Kanishka, a great Kushana king of the 1st or 2nd century ce, who ruled over an area that included portions of northern India and Central Asia. By the time of the Gupta dynasty (c. 320�c. 600 ce), Buddhism in India was being influenced by the revival of Brahmanic religion and the rising tide of bhakti (a devotional movement that emphasized the intense love of a devotee for a personal god). During this period, for example, some Hindus practiced devotion to the Buddha, whom they regarded as an avatar (incarnation) of the Hindu deity Vishnu, and some Buddhists venerated Hindu deities who were an integral part of the wider religious context in which they lived. 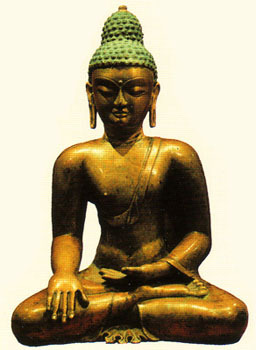 Throughout the Gupta and Pala periods, Hinayana Buddhists remained a major segment of the Indian Buddhist community. Their continued cultivation of various aspects of Buddhist teaching led to the emergence of the Yogacara school, the second great tradition of Mahayana philosophy. A third major Buddhist tradition, the Vajrayana or Esoteric tradition, developed out of the Mahayana school and became a powerful and dynamic religious force. The new form of text associated with this tradition, the tantras, appeared during the Gupta period, and there are indications that distinctively Tantric rituals began to be employed at this time as well. It was during the Pala period (8th�12th centuries), however, that the Vajrayana/Esoteric tradition emerged as the most dynamic component of Indian Buddhist life. Also during the Gupta period, there emerged a new Buddhist institution, the Mahavihara (�Great Monastery�), which often functioned as a university. This institution enjoyed great success during the reign of the Pala kings. The most famous of these Mahaviharas, located at Nalanda, became a major centre for the study of Buddhist texts and the refinement of Buddhist thought, particularly Mahayana and Vajrayana thought. The monks at Nalanda also developed a curriculum that went far beyond traditional Buddhism and included much Indian scientific and cultural knowledge. In subsequent years other important Mahaviharas were established, each with its own distinctive emphases and characteristics. These great Buddhist monastic research and educational institutions exerted a profound religious and cultural influence not only in India but throughout many other parts of Asia as well. Although Buddhist institutions seemed to be faring well under the Guptas, Chinese pilgrims visiting India between 400 and 700 ce discerned a decline in the Buddhist community and the beginning of the absorption of Indian Buddhism by Hinduism. Among these pilgrims was Faxian, who left China in 399, crossed the Gobi Desert, visited various holy places in India, and returned to China with numerous Buddhist scriptures and statues. The most famous of the Chinese travelers, however, was the 7th-century monk Xuanzang. When he arrived in northwestern India, he found �millions of monasteries� reduced to ruins by the Huns, a nomadic Central Asian people. In the northeast Xuanzang visited various holy places and studied Yogacara philosophy at Nalanda. After visiting Assam and southern India, he returned to China, carrying with him copies of more than 600 sutras. After the destruction of numerous Buddhist monasteries in the 6th century ce by the Huns, Buddhism revived, especially in the northeast, where it flourished for many more centuries under the kings of the Pala dynasty. The kings protected the Mahaviharas, built new centres at Odantapuri, near Nalanda, and established a system of supervision for all such institutions. Under the Palas the Vajrayana/Esoteric form of Buddhism became a major intellectual and religious force. Its adherents introduced important innovations into Buddhist doctrine and symbolism. They also advocated the practice of new Tantric forms of ritual practice that were designed both to generate magical power and to facilitate more rapid progress along the path to enlightenment. During the reigns of the later Pala kings, contacts with China decreased as Indian Buddhists turned their attention toward Tibet and Southeast Asia. Scholars do not know all the factors that contributed to Buddhism�s demise in its homeland. Some have maintained that it was so tolerant of other faiths that it was simply reabsorbed by a revitalized Hindu tradition. This did occur, though Indian Mahayanists were occasionally hostile toward bhakti and toward Hinduism in general. Another factor, however, was probably much more important. Indian Buddhism, having become primarily a monastic movement, seems to have lost touch with its lay supporters. Many monasteries had become very wealthy, so much so that they were able to employ indentured slaves and paid labourers to care for the monks and to tend the lands they owned. Thus, after the Muslim invaders sacked the Indian monasteries in the 12th and 13th centuries, the Buddhist laity showed little interest in a resurgence. In the 19th century Buddhism was virtually extinct in India. In far eastern Bengal and Assam, a few Buddhists preserved a tradition that dated back to pre-Muslim times, and some of them experienced a Theravada-oriented reform that was initiated by a Burmese monk who visited the area in the mid-19th century. By the end of that century, a very small number of Indian intellectuals had become interested in Buddhism through Western scholarship or through the activities of the Theosophical Society, one of whose leaders was the American Henry Olcott. The Sinhalese reformer Anagarika Dharmapala also exerted some influence, particularly through his work as one of the founders of the Mahabodhi Society, which focused its initial efforts on restoring Buddhist control of the pilgrimage site at Bodh Gaya, the presumed site of the Buddha�s enlightenment. Since 1950 the number of Buddhists in India has increased dramatically. One very small factor in this increase was the flood of Buddhist refugees from Tibet following the Chinese invasion of that country in 1959. The centre of the Tibetan refugee community, both in India and around the world, was established in Dharmsala, but many Tibetan refugees settled in other areas of the subcontinent as well. Another very small factor was the incorporation of Sikkim�a region with a predominantly Buddhist population now in the northeastern part of India�into the Republic of India in 1975. The most important cause of the contemporary revival of Buddhism in India was the mass conversion, in 1956, of hundreds of thousands of Hindus living primarily in Maharashtra state who had previously been members of the so-called scheduled castes (formerly called untouchables). This conversion was initiated by Bhimrao Ramji Ambedkar, a leader of the scheduled castes who was also a major figure in the Indian independence movement, a critic of the caste policies of Mahatma Gandhi, a framer of India�s constitution, and a member of India�s first independent government. As early as 1935 Ambedkar decided to lead his people away from Hinduism in favour of a religion that did not recognize caste distinctions. After a delay of more than 20 years, he determined that Buddhism was the appropriate choice. He also decided that 1956�the year in which Theravada Buddhists were celebrating the 2,500th year of the death of the Buddha�was the appropriate time. A dramatic conversion ceremony, held in Nagpur, was attended by hundreds of thousands of people. Since 1956 more than three million persons (a very conservative estimate) have joined the new Buddhist community. The Buddhism of Ambedkar�s community is based on the teachings found in the ancient Pali texts and has much in common with the Theravada Buddhist communities of Sri Lanka and Southeast Asia. There are important differences that distinguish the new group, however. They include the community�s reliance on Ambedkar�s own interpretations, which are presented in his book The Buddha and His Dhamma; the community�s emphasis on a mythology concerning the Buddhist and aristocratic character of the Mahar (the largest of the scheduled castes); and its recognition of Ambedkar himself as a saviour figure who is often considered to be a bodhisattva (future buddha). Another distinguishing characteristic of the Mahar Buddhists is the absence of a strong monastic community, which has allowed laypersons to assume the primary leadership roles. During the last several decades, the group has produced its own corpus of Buddhist songs and many vernacular books and pamphlets that deal with various aspects of Buddhist doctrine, practice, and community life. The first clear evidence of the spread of Buddhism outside India dates from the reign of King Asoka (3rd century bce), whose inscriptions show that he sent Buddhist missionaries to many different regions of the subcontinent as well as into certain border areas. Asokan emissaries were sent to Sri Lanka and to an area called Suvarnabhumi, which many modern scholars have identified with the Mon country in southern Myanmar (Burma) and central Thailand. According to Sinhalese tradition, Buddhism took root in Sri Lanka soon after the arrival of Asoka�s son, the monk Mahinda, and six companions. These monks converted King Devanampiya Tissa and much of the nobility. King Tissa built the Mahavihara monastery, which became the main centre of the version of Theravada Buddhism that was ultimately dominant in Sri Lanka. After Tissa�s death (c. 207 bce), Sri Lanka was ruled by kings from South India until the time of Dutthagamani (101�77 bce), a descendant of Tissa, who overthrew King Elara. Dutthagamani�s association with Buddhism clearly strengthened the religion�s ties with Sri Lankan political institutions. In the post-Dutthagamani period, the Mahavihara tradition developed along with other Sri Lankan monastic traditions. The Sinhalese chronicles report that, in the last half of the 1st century bce, King Vattagamani called a Buddhist council (the fourth in the Sinhalese reckoning) at which the Pali oral tradition of the Buddha�s teachings was committed to writing. The same king is said to have sponsored the construction of the Abhayagiri monastery, which eventually included Hinayana, Mahayana, and even Vajrayana monks. 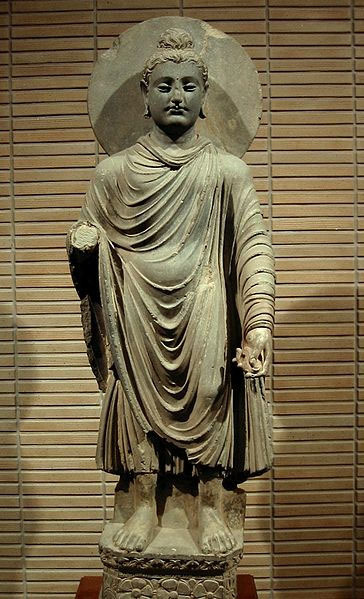 Although these cosmopolitan tendencies were resisted by the Mahavihara monks, they were openly supported by King Mahasena (276�303 ce). Under Mahasena�s son, Shri Meghavanna, the �tooth of the Buddha� was taken to the Abhayagiri, where it was subsequently maintained and venerated at the royal palladium. During the 1st millennium ce, the Theravada tradition in Sri Lanka coexisted with various forms of Hinduism, Mahayana Buddhism, and Esoteric Buddhism. 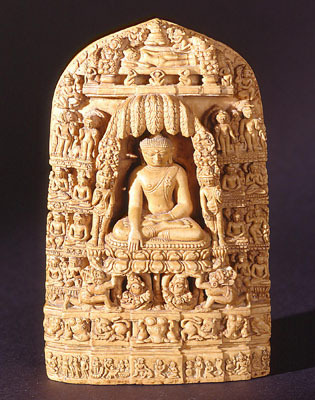 As Buddhism declined in India, it underwent a major revival and reform in Sri Lanka, where the Theravada traditions of the Mahavihara became especially prominent. Sri Lanka became a Theravada kingdom with a sangha that was unified under Mahavihara leadership and ruled by a monarch who legitimated his rule in Theravada terms. This newly constituted Theravada tradition subsequently spread from Sri Lanka into Southeast Asia, where it exerted a powerful influence. In early modern times Sri Lanka fell prey to Western colonial powers. The Portuguese (1505�1658) and the Dutch (1658�1796) seized control of the coastal areas, and later the British (1794�1947) took over the entire island. Buddhism suffered considerable disruption under Portuguese and Dutch rule, and the higher ordination lineage lapsed. In the 18th century, however, King Kittisiri Rajasiah (1747�81), who ruled in the upland regions, invited monks from Siam (Thailand) to reform Buddhism and restore the higher ordination lineages. During the late 18th and 19th centuries, the monastic community in Sri Lanka was divided into three major bodies. The Siam Nikaya, founded during the reform of the late 18th century, was a conservative and wealthy sect that admitted only members of the Goyigama, the highest Sinhalese caste. The Amarapura sect, founded in the early 19th century, opened its ranks to members of lower castes. 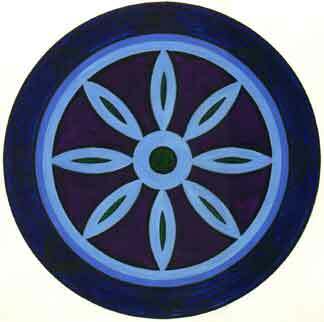 The third division, the Ramanya sect, is a small modernist group that emerged in the 19th century. In addition, several reform groups were established among the laity. These groups include the important Sarvodaya community, which is headed by A.T. Ariyaratne. This group has established religious, economic, and social development programs that have had a significant impact on Sinhalese village life. Since Sri Lanka gained its independence from the British in 1947, the country has been increasingly drawn into a conflict between the Sinhalese Buddhist majority and the Tamil Hindu minority. In the late 20th century, this conflict escalated into a vicious civil war. Many Sinhalese, including a significant number of monks, have closely associated their Buddhist religion with the political agenda and anti-Tamil violence of the more militant Sinhalese nationalists. Other Buddhist leaders, however, have tried to adopt a more moderate position and to encourage a negotiated solution that would reestablish the kind of peaceful coexistence that has characterized Sri Lankan politics through the greater part of the island�s long history. The peoples of Southeast Asia have not been mere satellites of the more powerful Indian and Chinese civilizations. On the contrary, the cultures that arose in these three vast areas might better be thought of as alternative developments that occurred within a greater Austroasiatic civilization, sometimes called the Asia of the monsoons. The transmission of Buddhism and Hinduism to Southeast Asia can thus be regarded as the spread of the religious symbols of the more advanced Austroasiatic peoples to other Austroasiatic groups sharing some of the same basic religious presuppositions and traditions. Although some scholars locate the Suvarnabhumi (�Land of Gold�), to which Asokan missionaries were supposedly sent, somewhere on the Malay Peninsula or in Indonesia, this is probably not accurate. It is certain, however, that Buddhism reached these areas by the early centuries of the 1st millennium ce. With the help of the monk Gunavarman and other Indian missionaries, Buddhism gained a firm foothold on Java well before the 5th century ce. Buddhism was also introduced at about this time in Sumatra, and by the 7th century the king of Srivijaya on the island of Sumatra was a Buddhist. When the Chinese traveler I-ching visited this kingdom in the 7th century, he noted that Hinayana was dominant in the area but that there were also a few Mahayanists. It was also in the 7th century that the great scholar from Nalanda, Dharmapala, visited Indonesia. 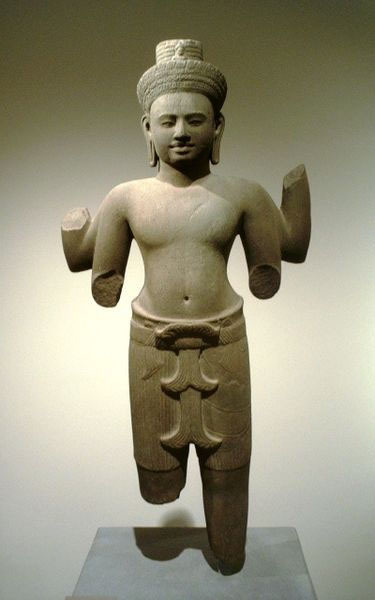 The Shailendra dynasty, which ruled over the Malay Peninsula and a large section of Indonesia from the 7th century to the 9th century, promoted the Mahayana and Tantric forms of Buddhism. During this period major Buddhist monuments were erected in Java, including the marvelous Borobudur, which is perhaps the most magnificent of all Buddhist stupas. From the 7th century onward, Vajrayana Buddhism spread rapidly throughout the area. King Kertanagara of Java (reigned 1268�92) was especially devoted to Tantric practice. In the Malay Peninsula and Indonesia, as in India, Buddhism gradually lost its hold during the first half of the 2nd millennium ce. In some areas Buddhism was assimilated to Hinduism, forming a Hindu-oriented amalgam that in some places (for example in Bali) has persisted to the present. In most of Malaysia and Indonesia, however, both Hinduism and Buddhism were replaced by Islam, which remains the dominant religion in the area. In modern Indonesia and Malaysia, Buddhism exists as a living religion primarily among the Chinese minority, but there is also a small non-Chinese community of Buddhists that is concentrated in the vicinity of Borobudur. A second area of Buddhist expansion in Southeast Asia extends from Myanmar in the north and west to the Mekong delta in the south and east. According to the local Mon/Burman traditions, this is Suvarnabhumi, the area visited by missionaries from the Asokan court. It is known that Buddhist kingdoms had appeared in this region by the early centuries of the 1st millennium ce. In Myanmar and Thailand, despite the presence of Hindu, Mahayana, and Vajrayana elements, the more-conservative Hinayana forms of Buddhism were especially prominent throughout the 1st millennium ce. Farther to the east and south, in what is now Cambodia and southern Vietnam, various combinations of Hinduism, Mahayana Buddhism, and Vajrayana Buddhism became prevalent. Throughout much of the history of Angkor, the great imperial centre that ruled Cambodia and much of the surrounding areas for many centuries, Hinduism seems to have been the preferred tradition, at least among the elite. In the late 12th and early 13th centuries, however, the Buddhist King Jayavarman VII built a new capital called Angkor Thom that was dominated by Mahayana/Vajrayana monuments, which represent one of the high points of Buddhist architecture. Two new Buddhist groups, Santi Asoke (founded 1975) and Dhammakaya, are especially interesting. Santi Asoke, a lay-oriented group that advocates stringent discipline, moral rectitude, and political reform, has been very much at odds with the established ecclesiastical hierarchy. The Dhammakaya group has been much more successful at gathering a large popular following but has also become very controversial because of its distinctive meditational practices and questions concerning its care of financial contributions from its followers. In the other Theravada countries in Southeast Asia, Buddhism has had a much more difficult time. In Myanmar, which endured an extended period of British rule, the sangha and the structures of Buddhist society have been seriously disrupted. Under the military regime of General Ne Win, established in 1962, reform and modernization were limited in all areas of national life, including religion. Since the suppression of the pro-democracy movement in the late 1980s, the country�s military rulers have used their support of a very traditional form of Buddhism to legitimize their highly repressive regime. In Laos and Cambodia, both of which suffered an extended period of French rule followed by devastation during the Vietnam War and the violent imposition of communist rule, the Buddhist community has been severely crippled. Beginning in the 1980s, however, it showed increasing signs of life and vitality. In Laos it was recognized by the government as a part of the national heritage, and in Cambodia it was even given the status of a state religion. The first dhyana (Zen; Vietnamese: thien), or meditation, school was introduced by Vinitaruci, an Indian monk who had gone to Vietnam from China in the 6th century. In the 9th century a school of �wall meditation� was introduced by the Chinese monk Vo Ngon Thong. A third major Zen school was established in the 11th century by the Chinese monk Thao Durong. From 1414 to 1428 Buddhism in Vietnam was persecuted by the Chinese, who had again conquered the country. Tantrism, Daoism, and Confucianism also filtered into Vietnam at this time. Even after the Chinese had been driven back, a Chinese-like bureaucracy closely supervised the Vietnamese monasteries. The clergy was divided between those who were highborn and Sinicized and those in the lower ranks who often were active in peasant uprisings. During the modern period Mahayana traditions in northern and central Vietnam have coexisted with Theravada traditions from Cambodia in the south. Rather loosely joined together, Vietnamese Buddhists managed to preserve their traditions through the period of French colonial rule in the 19th and 20th centuries. During the struggle between North and South Vietnam in the 1960s and early �70s, many Buddhists worked to achieve peace and reconciliation, though they met with little success; to protest the South Vietnamese regime of Ngo Dinh Diem, some Buddhist monks turned to self-immolation. Under the communist regime that has ruled the reunited country since 1975, conditions have been difficult, but Buddhism has persisted. Reports in the late 1980s and 1990s indicated signs of vitality, though there have also been reports of serious government limitations on Buddhist activities. 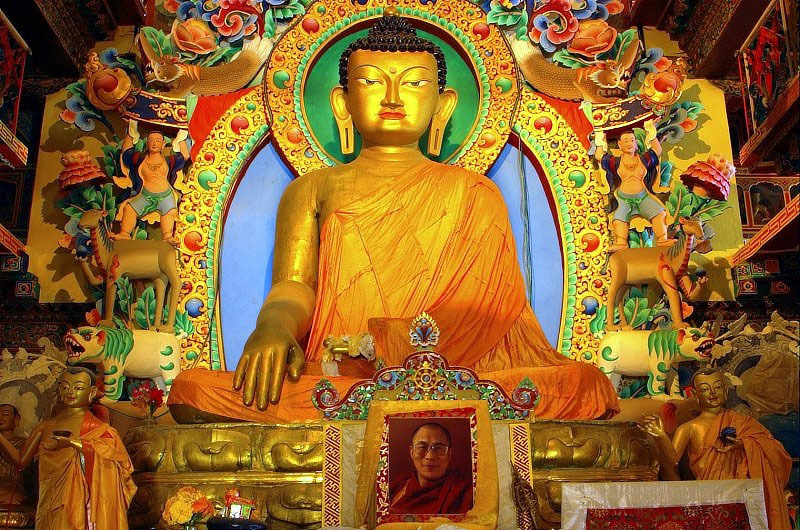 Tibetan Buddhism has exerted a considerable influence in the Himalayan areas situated along Tibet�s southern border. 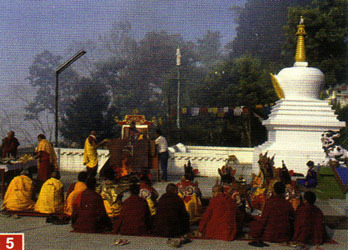 In Nepal, Buddhism interacted with both India and Tibet. Although there is evidence that suggests that the Buddha was born in the southern part of the area that is now Nepal�at Lumbini, about 15 miles (24 km) from Kapilavatthu (Kapilavastu)�Buddhism seems to have been actively propagated only later, probably under Asoka. By the 8th century Nepal had fallen into the cultural orbit of Tibet. A few centuries later, as a result of the Muslim invasions of India, both Hindus (such as the Brahmanic Gurkha aristocracy) and Buddhists took refuge in the country. The Tibetan influence on the Himalayan tradition is indicated by the presence of Tibetan-style prayer wheels and flags. The Indian heritage is especially evident in the caste system that embraces Buddhists and non-Buddhists alike. In the late 20th century, a significant Theravada reform movement took root among the Newari population. The adherents of this movement, who have important connections with Theravada practitioners in Myanmar and Sri Lanka, oppose the maintenance of traditional caste distinctions. In Bhutan a Tibetan lama introduced Buddhism and a Tibetan style of hierarchical theocracy in the 17th century. Buddhism practiced in Bhutan has been influenced by the Tibetan Bka�-brgyud-pa sect, which has stressed the magical benefits of living in caves and has not enforced on its clergy the discipline of celibacy. Buddhism in Bhutan, like Buddhism in Nepal, is coming into increasing contact with modernizing forces that are beginning to undermine many of its traditional practices. Not until the modern period, however, is there evidence of a serious Buddhist presence in the Western world. Beginning in the mid-19th century, Buddhism was introduced into the United States and other Western countries by large numbers of immigrants, first from China and Japan and later from other countries, especially those of Southeast Asia. In addition, Buddhism gained a foothold among a significant number of Western intellectuals and�particularly during the 1960s and early �70s�among young people seeking new forms of religious experience and expression. The interest of Westerners in Buddhism was greatly fostered by the work of Buddhist missionaries such as the Japanese scholar D.T. Suzuki (1870�1966) and a number of Tibetan Buddhist teachers who moved to the West following the Chinese conquest of their homeland in 1959.